A 28 year-old man has been arrested following a crash that saw a car flip onto its roof and plough into a house in Halifax. The incident happened on Huddersfield Road at 5pm on Sunday. 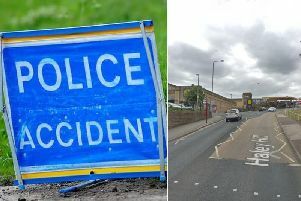 A West Yorkshire Police spokesperswon said emergency crews were called to the scene which involved a black Volvo estate and a black Hyundai estate. The 28-year-old man was taken to Huddersfield Royal Infirmary but was later discharged. He was later arrested for aggravated vehicle taking.